U.S. Department of Agriculture (USDA) scientists have developed a starch-based coating that improves biodegradability and water resistance in products like paper and plastic films. While 100 percent biodegradable, starch lacks the flexibility necessary for many plastic and coating applications. Polyvinyl alcohol (PVOH), a synthetic polymer, is usually used in films and coatings to provide flexibility. However, it has limited biodegradability. At the USDA-Agricultural Research Service’s (ARS) National Center for Agricultural Utilization Research in Peoria, Illinois, scientists develop new value-added starch-based products to replace synthetic products such as polyethylene bags and polystyrene foam packing materials, which can accumulate in landfills. ARS chemists George Fanta and Gordon Selling, along with their colleagues, recently made starch complexes that, when blended with PVOH, improve strength, enhance flexibility and improve water resistance. According to Fanta, the starch complex/PVOH blends have valuable properties not found separately in either material. The films could dramatically enhance future production of food packaging, plastic bags and other synthetic products. Scientists expect to apply the technology to additional items, like clothing, in the future. For example, they envision coating umbrellas made of cotton with the complex rather than today’s reliance on synthetic materials such as nylon, polyester or acrylic. 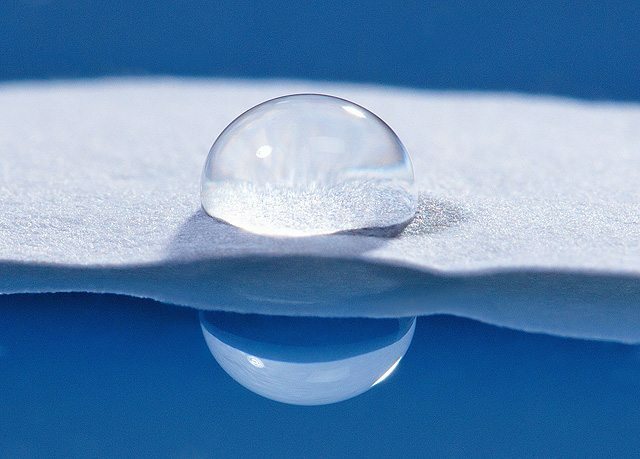 The coatings resist water better than those prepared from pure PVOH, according to Selling. A drop of water on paper coated with these complexes remains on the surface for minutes and often evaporates before soaking into the paper. ARS has filed a patent application covering the new paper-related technology, which should prove ideal for small papermaking companies. The technology uses ingredients and a production process that are both safe and inexpensive. Read more about this research in the April issue of AgResearch.